On the 8th January at 03:00 EVE Local time in the system of Meildolf, Molden Heath, Forces belonging to Bangarang. clashed with those of Shadow Cartel and Did He Say Jump over an Azbel Citadel in the system. The valuable Azbel belonging to a small local manufacturing group had been reinforced twice before. It would exit it’s invulnerability timer at 03:00. Azbels are a manufacturing citadel often used for building capital class ships which can be worth in excess of 10 billion ISK when fitted correctly. Knowing they had little chance of defending the Azbel from Bangarang., the group reached out to Shadow Cartel for help. Agreeing to assist in the defense Shadow Cartel contacted their close friends Did He Say Jump who were originally planning to assist in killing the citadel. Agreeing to help their friends and defend the Azbel Did He Say Jump and Shadow Cartel assembled a 100 man Tech 3 Cruiser fleet consisting of over 80 T3s and around 20 Guardians. The fleet was placed on a titan ready to bridge into the fray. Forming nearby the attackers consisting of Bangarang. Hell’s Pirates, hotdropoclock enterprises and also Meme. Team. 6. prepared to kill the Azbel. They formed a 70 man Machariel battleship fleet with a Guardian squad for logistics. The attackers decided to bring a small force of roughly 20 Machariels and 4 Guardians to force an escalation as they had seen multiple scouts enter the destination and cloak. Knowing Shadow Cartel and Did He Say Jump would arrive at some point the attacking forces prepared for a large brawl.The remaining 50 man fleet belonging to Bangarang warped to a friendly Titan and waited to be bridged into the conflict zone. Bangarang., who expected Did He Say Jump to bring a Machariel battleship fleet, would soon regret its own ship comp decision. Burning to the system the attacking fleet quickly anchored up on the citadel and launched volleys into the Azbel’s thick structure plating. Without delay a neutral Maelstrom battleship undocked, lighting a cynosural beacon and bringing in a single Phoenix dreadnought. 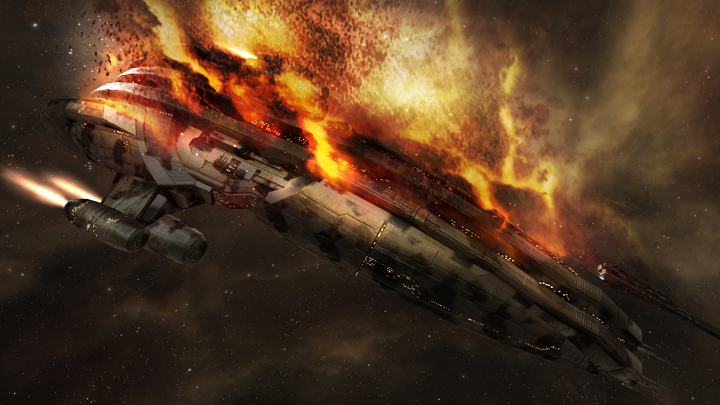 The Machariels quickly targeted the Phoenix, slowly burning it’s powerful shields as drones stayed on the Azbel to prevent the citadel from repairing itself. Slowly but surely the Phoenix’s shields started to fail. Barrage upon barrage of Autocannon fire by the Machariels overcame the Phoenix and as the lights flickered off it erupted in a mighty explosion. With this the battlefield went quiet. Almost 5 minutes passed and the Azbel’s hit points reduced to almost 50%. All seemed lost for the Azbel at this stage. Then a neutral Legion belonging to Shadow Cartel uncloaked lighting a cynosural beacon and jumping in the Shadow Cartel and Did He Say Jump fleet. The attackers reacted, targeting the logistics wing of the fleet. Salvo after salvo rained down on the enemy Guardian wing but it managed to tank. Unable to break anything and watching local spike the order was given and Bangarang. lit a cynosural beacon of its own bringing in the remainder of its Machariel battleship fleet. A fierce fight erupted and Bangarang. decided to try again to break the enemy Guardian wing which proved to be to well established. With that they switched and concentrated on Shadow Cartels T3 cruisers and heavy interdiction cruisers. Machariel volleys crushed into the hulls shredding them almost instantly. Shadow Cartel and Did He Say Jump were not sitting idle though. Shells were being traded back to the Machariel battleship fleet and crushing the thick armor plates of the behemoths. One after another Machariels succumbed to the immense firepower of the enemy fleet and exploded. Throughout the fight things seemed even but as the enemy logistics wing stabilized and with the small signature radius of the T3 cruisers the Machariel battleship fleet was struggling to apply damage to these small targets. The enemy T3 Cruisers however were relentless, volley upon volley landed perfectly on the large Machariels shredding them completely. The Machariel battleship fleet started to crumble having suffered a further blow in its fleet commander been dispatched from the grid early in the fight. As the Macharial fleet fell to pieces, the call was made to retreat or risk total annihilation. Out shipped, out manned and out gunned the attacking fleet aligned out and attempted to warp off and save as many ships as possible. Unfortunately though the enemy fleet was able to spread warp disruptors, catching most of the attacking fleet. Barrage after barrage came down destroying the last remaining Machariels and the field fell silent. With the attackers’ Machariel fleet in tatters Shadow Cartel and Did He Say Jump looted the field and guarded the Azbel as it repaired itself successfully. All told the battle lasted 30 minutes with no time dilation being recorded. Local held 200 pilots at the peak of the fighting. PunkRAwk is a member of Bangarang. and covers battles across New Eden. on a entirely different subject but it has pretty much the same layout and design. Superb choice of colors! I do not even know the way I finished up right here, but I assumed this submit was good. Hi there colleagues, how is everything, and what you wish for to say about this piece of writing, in my view its actually remarkable for me. experience and thoughts online. Please let me know if you have any recommendations or tips for brand new aspiring blog owners.